Original content posted July 2013. Updated March 2019. Pizza crust is such a personal thing and at times, a controversial topic. At our house, we like Chicago-style, thick crust pizza. And until this Perfect Pizza Crust (No Knead, No Rise) recipe came into our lives, we usually ordered pizza out. Although it isn’t a thick crust, it seems to come in somewhere in the middle. It’s soft and chewy and withstands the absurd number of toppings we seem to pile on top of it. Perfect pizza crust, indeed! 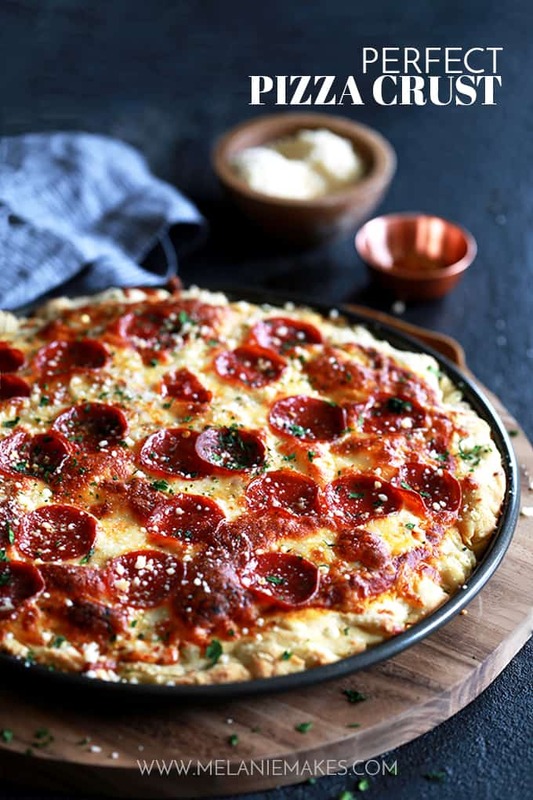 This five ingredient Perfect Pizza Crust (No Knead, No Rise) takes just 20 minutes to prepare and 15 of those minutes are spent doing absolutely nothing. I mean, perfect AND easy?! Talk about amazing! In a medium sized bowl you’ll stir together water, yeast and salt. And then let it sit for 10 minutes until it appears creamy and has bubbles on the surface. A sure sign you’ve got great yeast! Next, you’ll add bread flour and olive oil. 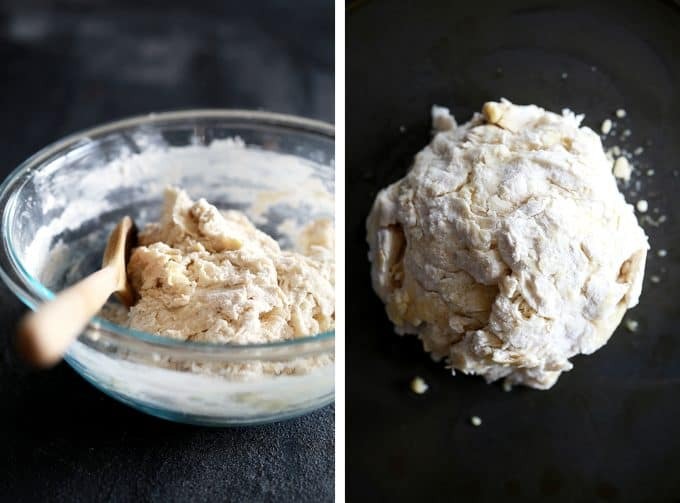 TIP: If you don’t have bread flour, you definitely can substitute all purpose flour that you likely already have hanging out in your pantry, but if you’re willing to spend a few extra dollars, do it! The bread flour has a higher amount of protein which means that it gives this pizza crust it’s characteristic chew. Grab a wooden spoon and stir the flour and oil into the yeast mixture. And wait another five minutes. Your five minutes are up, now what? Easy! You simply oil your pizza pan – lightly oil your hands as well to avoid sticking! – and place your ball of dough on the pan. You’ll then want to gently press the pizza dough into an even layer. Once the dough is pressed into the pan, you’re ready to start loading on the toppings! Our typical pie goes something like pizza sauce, cheese and then whatever toppings we are craving. Including my Bacon Double Cheeseburger Pizza or my son’s favorite Chili Cheese Dog Pizza. No matter the toppings, this Perfect Pizza Crust (No Knead, No Rise) is the perfect starting point for any pizza night! If you’ve tried this Perfect Pizza Crust (No Knead, No Rise) or any other recipe on Melanie Makes, please let me know your thoughts in the comments below. I love hearing from you and respond to each and every comment! 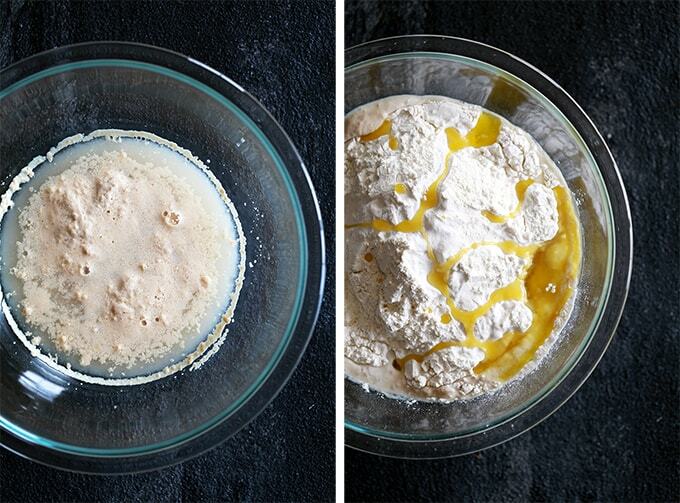 In a medium bowl, dissolve yeast and sugar in water. Let stand until creamy, about 10 minutes. Stir in flour, salt and oil. Let rest for 5 minutes. Lightly oil pizza pan to avoid sticking. Using oiled hands, press dough onto pizza pan and top with favorite toppings. Spread with desired toppings and bake for 20 minutes or until golden brown. Looking for other toppings for this Perfect Pizza Crust (No Knead, No Rise)? It would definitely be a great base for this Mushroom Sausage Pesto Pizza, this BBQ Beef Pizza and this Hawaiian BBQ Chicken Pizza. Friday night pizza night will never be the same. So delish! I cannot wait to try this at the weekend with the kids! Hope that you all enjoy it, Jade! How convenient that it is no-knead and no-rise! 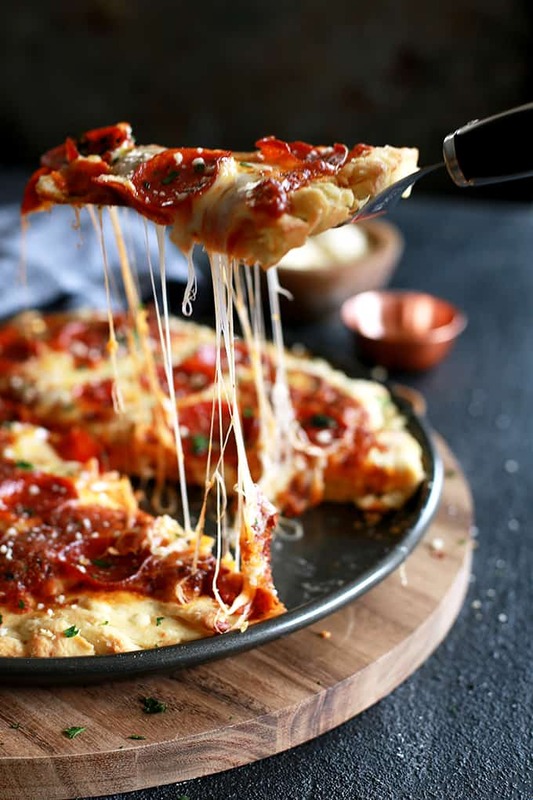 Great way to have homemade pizza for the family for pizza night or any night of the week!! Completely agree, Lora - thank you! I love to do pizza for parties and I absolutely LOVE this crust! Thank you for a wonderful recipe. 5 stars! So glad to hear you enjoy it, Bee - thank you! Wow! I can’t wait to try this AMAZING piza! This is definitely on the “To make” list for my family. Pinned! One of our family's favorites and hope it will be for yours too! What a great lunch or dinner! 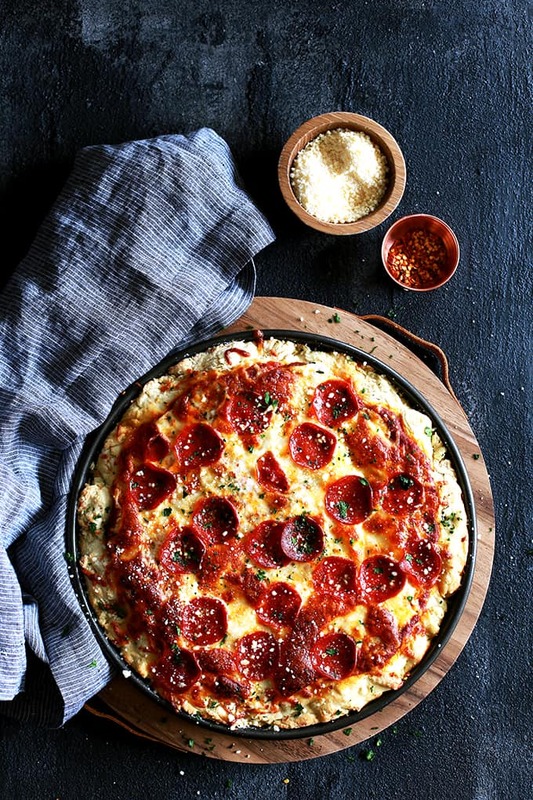 My kids could eat pizza everyday; I'll have to make this for them! Can't wait to hear what you think, Beth! Pizza is always a winning idea for dinner! Love how easy this is to make at home vs having to get take out. So easy! It's ready before the delivery guy could get there! Yum! 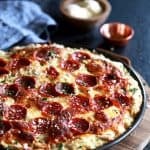 This has to be the best looking pizza I've seen, I think this makes a perfect family dinner that everybody would enjoy. This is so easy and we all love it. My husband and I like it the way you say, in a 12” pan, but my kids like it a bit thinner so I split the dough between my 12” & 10” pans and they all think it’s the best pizza ever. One of my sons can’t have soy, which is in most pizza dough, so it’s great to have such an easy, tasty option for our family to enjoy. Thrilled you enjoyed it as much as we do, Michelle! Thanks so much for taking the time to comment! This is definitely a must-make! I can't wait to try this! It's always a hit at our house! I love pizza so much! 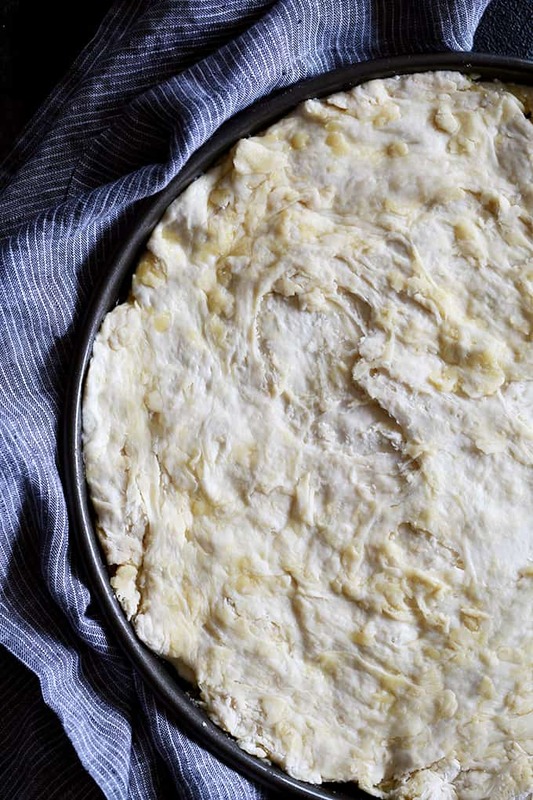 I need to try this pizza dough soon! I can't wait to try this for our next pizza night! I think you'll love it, Dee! Love it when there is no need to knead! You had me at doing nothing for 15 minutes, lol! What a quick and easy way to skip delivery! We do pizza every Friday so I can't wait to try this out! It looks so easy! We used to as well, Jen - now we make our own! A perfect pizza crust that requires less work? Count me in! I think you'l love it, Kimberly! What size pizza pan do you use? Hi, Pete - I use the typical 12" pizza pan for this recipe. Hope that helps! Great pizza crust! I made this for the first time last night. The family loved it; we have found our new favorite pizza crust. And, I loved the fact that I could have dinner on the table in under an hour! I don't always remember/have time/plan ahead enough to make a crust ahead of time. So, this is perfect!!! Thank you! YES! So happy that you and your family enjoyed it. Proof that pizza crust doesn't have to be difficult to be delicious! As a stalker from the 2peas days (i.e. 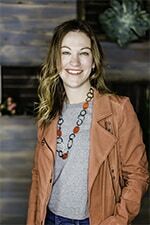 early 2000s) I've loved watching your blog and am most excited about your recent culinary adventures. We tried this crust last week and I will use it again and again. I'm hoping followers of my blog head over where I linked this recipe to see all the fabulous foods you've been preparing. Thanks for sharing. Hey, Elizabeth! You've made my day! So happy that you all enjoyed it - it's definitely a favorite for our family, too! I have this on my "to try" this and can't wait! We haven't made homemade pizza for a while in our house and I know that it'll be such a fun, special treat! ooh thanks for the recipe. Not known for my baking skills as I have had issues with a number of items. They taste fine, just not pretty.